I have a few newer Corgi commercials in a cabinet at home and my 7 year old has really taken an interest in the older lorries. I found some old Dinky lorries out the other day and put them in the cabinet too and that really got his interest. From that we had a good look round at ebay to see what sort of prices things are going for. Nothing pristine in boxes etc just some older cars and lorries from the 50's that could go in the cabinet and he could then play with them. I was surprised to be honest how low some of the prices are, does anyone on the forum collect Dinky toys? he could repair & repaint the cheaper ones. I went through a phase of collecting old toy racing cars, which I still have. Tatty "project" Dinky cars can still be found for not too much outlay. In my early teens I gave all my Dinkies, Corgis and Matchboxes to a younger cousin but he subsequently disposed of them, I know not where. However I do still have three larger toys from my childhood. 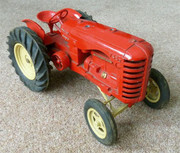 A diecast Massey-Ferguson, a battery operated plastic Velox and a battery operated MGA with remote steering. I do recall that when I was a youngster my Father lost his job and we went through quite a tough period. He had a number of his old Dinky toys and he sold some of the rarer lorry ones just to put food on the table. Its such a shame, though he did keep a small tub with his Dinky cars in. I recall there also being a couple of buses in the tub too. Peter: are those the Victory Industries of Guildford; Vauxhall and A-H? I used to live about a mile from their place and had the Vauchall, an MM and an open wheeled racing car. Yes Penman, they are Victory Industries. The green one is actually an MGA though. I don't know of hand who made the tractor. Possibly Triang. You can steer it with the steering wheel. Could the tractor be Chad Valley? I had one like that but gave it to a friend years ago, it was either Tri-ang or CV. Too lazy to go up into the loft I've tracked it down on eBay. It's a Lesney Moko Massey Harris 745D large scale 8"